A rare bottle of Dalmore 62-year-old single malt whisky – one of only 12 originally released in 2002 – is expected to make up to £50,000 when it is auctioned later this month. The 12 Pointer, number three in the 12-bottle series, is being sold on behalf of an unnamed businessman by Sotheby’s at the auction house’s London sale of Finest and Rarest Wines, Spirits and Vintage Port on 20 September. The 900-lot auction is dominated by an impressive array of fine wine, including Bordeaux First Growths and top Burgundy domaines, but the Dalmore lot – the only whisky to feature in the sale – has a pre-sale estimate of £40,000-50,000. The 12-bottle series was a vatting of four casks of Dalmore, filled in 1868, 1876, 1926 and 1939. 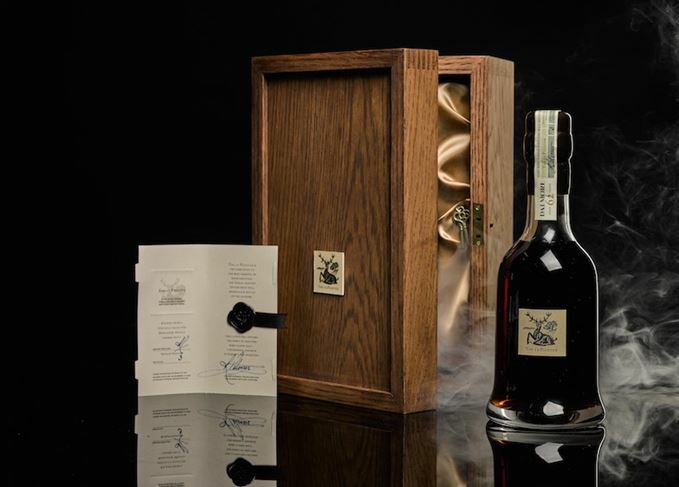 Each bottle was named after a key element in the distillery’s history – the ‘12 pointer’ referring to the Highland distillery’s stag emblem – and came in a wooden case with a certificate signed by Dalmore master distiller Richard Paterson. Given the history of the bottlings, the pre-sale estimate appears on the low side: one bottle was auctioned soon after the series’ release in 2002 for £25,000, while a businessman paid £32,000 for another – named Matheson after the distillery founder – at the Pennyhill Park Hotel in Surrey in 2005 (he drank it there and then). In 2011, at the height of the Far East luxury spending boom, another of the 12 bottles, released from Paterson’s private collection, was sold for a world record S$250,000 (£125,000) at Singapore’s Changi Airport. The rare 40-year-old single malt is limited to 750 bottles. Up to 270 bottles of the £200 Dalmore Distillery Exclusive Vintage 2000 are available. The three single malts are finished in tawny Port casks sourced from Graham’s. The £1 million Dalmore whisky collection has found a buyer, four years after being launched.